AZEK® Brand Cellular PVC is a synthetic wood that will never crack, warp, or rot. It's impervious to moisture, salt, and insects but feels and sounds like real wood! In addition to the items we stock that are made by AZEK® we also make most of our items in AZEK® Brand Cellular PVC, THE wood alternative. Read more about the benefits of AZEK® Cellular PVC. We're in the forefront of helping the front porch make a comeback with low maintenance products that look and feel like traditional wood. 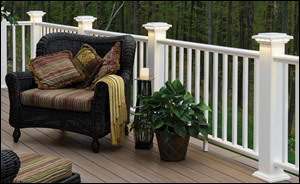 AZEK® Porch Flooring is a perfect example. They are designed to look very traditional, while resisting stains and scratches. With AZEK® Porch Flooring you’ll make a great first impression that will look new for many years! Photo at left features AZEK® Porch Flooring in Brownstone and the AZEK® Railing System. Likewise, stain and scratch resistant AZEK® Deck Boards are the smart AND beautiful ultra-low maintenance decking material. Spend less time on upkeep and more time enjoying your Deck. Photo at right shows Slate Gray Deck Boards. AZEK® Porch and Deck Rails (shown at left with available AZEK® Newel Posts Sleeves, lighted Post Caps, and Post Skirts) come in White Rail Kits (Rails with support inserts, all hardware, Foot Blocks, and square 1-1/4" x 1-1/4" Balusters), or as Rail Packs (everything in the Kits except Balusters, and available in White plus four colors). 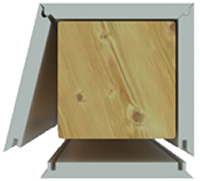 AZEK® Beadboard and Mouldings feature the same crisp detail found in authentic wood mouldings, but with the longevity and durability of cellular PVC. The Mouldings we produce are also available in genuine AZEK® PVC. Use these low maintenance products for exterior projects or high moisture areas inside, such as bathrooms. They'll add a lot of visual impact to your projects, and without upkeep and replacement costs, they'll look even better as the years go by! As a service to our customers, we also sell AZEK® Trimboards and Sheets. Same solid Cellular PVC in various sizes. The Traditional surface closely matches natural wood painted white, while AZEK's Frontier surface (only on one side - the other side will be the Traditional surface) closely resembles weathered wood painted white. The Frontier surface is generally not as good a match for painted trim. Because of their design, AZEK® Column (Post) Wraps are very easy to install – even by one person. Three of the four panels are shipped connected with press-fit locking seams. When folded together, these three panels easily slip around a structural post. The fourth panel then locks into place, creating a tight, secure enclosure for the post. Interior corner detailing provides additional surface area to enhance adhesive bonding between panels, as seen in photo at left. For easier installation, we offer Fasteners and Adhesive for AZEK® PVC products.